Veterinary Associates of Westville is a well-established out-patient clinic providing comprehensive medical, surgical and dental care. We provide a broad spectrum of diagnostic procedures through in-house testing and the use of external laboratories. The in-house laboratory does cytology, skin scrapings, urinalysis, and fungal cultures. The outside laboratories do blood counts,blood chemistry testing, thyroid testing, bacterial culture and sensitivity testing, pathology as well as providing all modern laboratory tests. At the office we do tonometry (testing for glaucoma) as well as measuring blood pressure with a doppler unit. We do surgery and dentistry at the Central Hospital. The Central Hospital has 6 surgery suites, digital x-ray capabilities, ultrasound, and endoscopy. The hospital also provides intensive care 24 hours daily. It is comforting to know that if your pet requires hospitalization there is always a veterinarian and nurses to care for them. At Veterinary Associates of Westville we strive to offer not only sound advice, but also optimal veterinary care, thus allowing you the enjoyment of your companion for a maximum number of years. Our job is not only to treat your pet when he or she isn't feeling well, but also to help you learn how to keep your best friend happy and healthy. 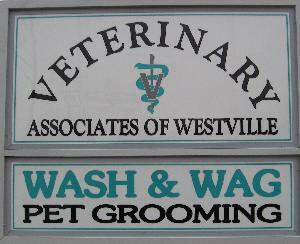 Dog and cat grooming is available through Wash and Wag Pet Grooming. Their phone number is (203) 389-5032.